Lineage. Constituted as 381 Fighter Squadron (Single Engine) on 11 Feb 1943. Activated on 1 Mar 1943. Redesignated as: 381 Fighter Squadron, Single Engine on 20 Aug 1943; 161 Tactical Reconnaissance Squadron on 25 Aug 1944. Inactivated on 9 Nov 1945. Redesignated as 161 Reconnaissance Squadron, Photo (Jet Propelled) on 9 Jul 1946. Activated on 31 Aug 1946. 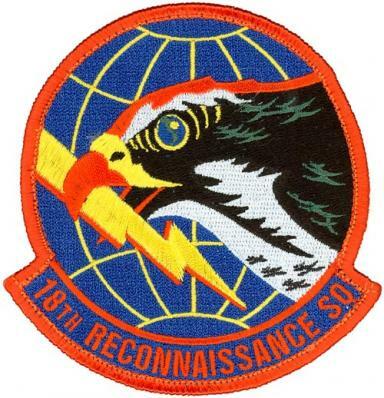 Redesignated as: 161 Tactical Reconnaissance Squadron, Photo-Jet on 28 Aug 1948; 18 Tactical Reconnaissance Squadron, Photo-Jet on 10 Oct 1950; 18 Tactical Reconnaissance Squadron on 1 Oct 1966. Inactivated on 30 Sep 1979. Redesignated as 18 Reconnaissance Squadron on 14 Mar 2006. Activated on 3 Apr 2006. Inactivated on 24 Aug 2007. Activated on 11 Dec 2009. Assignments. 363 Fighter (later, 363 Tactical Reconnaissance) Group, 1 Mar 1943 (attached to 10 Photographic Group, 23 Dec 1944-3 Jan 1945); 67 Reconnaissance Group, 3 Ju1-9 Nov 1945. 363 Reconnaissance (later, 363 Tactical Reconnaissance) Group, 31 Aug 1946; Fourteenth Air Force, 23 Sep 1949 (attached to 20 Fighter Wing, 20 Sep 1949-2 Apr 1951); 363 Tactical Reconnaissance Group, 2 Apr 1951; 432 Tactical Reconnaissance Wing, 8 Feb 1958; 66 Tactical Reconnaissance Wing, 1 Jun 1959; 363 Tactical Reconnaissance Wing, 30 Jan 1970-30 Sep 1979. 9 Operations Group, 3 Apr 2006-24 Aug 2007. 432 Operations Group, 11 Dec 2009-. Stations. Hamilton Field, CA, 1 Mar 1943; Santa Rosa AAFld, CA, 23 Aug 1943; Sacramento Mun Aprt, CA, 6 Oct-2 Dec 1943; Keevil, England, 20 Dec 1943; Rivenhall, England, 2 Feb 1944; Staplehurst, England, 14 Apr 1944; Maupertus, France, c. 4 Jul 1944; Azeville, France, 23 Aug 1944; Montrevil, France, 11 Sep 1944; Sandwieler, Luxembourg, 2 Oct 1944; Le Culot, Belgium, 31 Oct 1944 (operated from Conflans, France, 23 Dec 1944-4 Jan 1945); Venlo, Holland, 11 Mar 1945; Gutersloh, Germany, 16 Apr 1945; Brunswick, Germany, 26 Apr 1945; Wiesbaden, Germany, 19 May 1945; Reims, France, c, 3 Jul-c. 4 Sep 1945; Drew Field, FL 16 Sep-9 Nov 1945. Brooks Field, TX, 31 Aug 1946; Langley Field, VA, 1 Nov 1946; Shaw AFB, SC, 23 Sep 1949-25 May 1959; Laon, France, 1 Jun 1959; RAF Upper Heyford, England, 1 Sep 1966; Shaw AFB, SC, 30 Jan 1970-30 Sep 1979. Beale AFB, CA, 3 Apr 2006-24 Aug 2007. Creech AFB, NV, 11 Dec 2009-. Aircraft. P-39, 1943; P-51, 1944-1945; F-6, 1944-1945. F-6, 1946-1947; FP-80, 1946-1955; T-33, 1950-1954; RF-84, 1954-1957; RF-101, 1957-1970; RF-4, 1970-1979. RQ-4, 2006-2007. MQ-1, 2009-. Operations. Engaged in air defense operations until Nov 1943. Participated in combat operations in the European Theater of Operations, 24 Feb 1944-5 May 1945. Replacement training, 1950-1953. Engaged in tactical and evaluation exercises in the U.S., including visual and photographic reconnaissance, processing and evaluation of reconnaissance data, 1954-1959. Carried out reconnaissance missions in support of USAFE and North Atlantic Treaty Organization missions, Jun1959-Jan 1970. From Feb 1970-Sep 1979, regularly participated in visual and photographic reconnaissance missions in CONUS and provided training for US and allied reconnaissance personnel. From Apr 2006 to Aug 2007, provided initial training for RQ-4 Global Hawk aircrews and mission planners. From Dec 2009, provided real-time intelligence, strike, interdiction, close air support, and special missions to deployed warfighters. Decorations. Citation in the Order of the Day, Belgian Army: 1 Oct-17 Dec 1944; 18 Dec 1944-15 Jan 1945. Belgian Fourragere. Air Force Outstanding Unit Awards: 1 Jan-31 Dec 1962; 1 Jul 1974-1 Jul 1976; 2 Jul 1976-30 Jun 1978. Emblem. Approved on 9 Aug 2006.